* NEWS and CALL-TO-ACTION, forwarded by Kinship Circle members. * CONTACT INFO to reply directly to the activist who supplied the alert. * Submissions are from KC members. 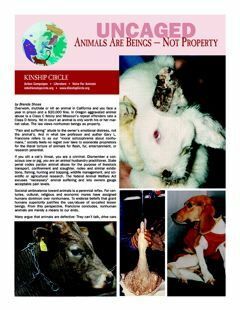 Kinship Circle did not write/research alerts. * Contact person who supplied alert — NOT KINSHIP CIRCLE. From Jeff de la Rosa (Stu’s dad) stu.911 [at] gmail.com — Below is a letter I also posted on LA Craigslist. I am encouraging people to contact Ed Boks to beg for time for Stu until I can get the appeal filed. He can legally kill Stu at any moment. This is an informal notice that the decision by Los Angeles Superior Court Judge Yaffe, in case will be appealed to the California 2nd District Court of Appeals in a timely fashion. A substitution of attorney form will follow as well as the NOTICE of APPEAL and other documents. An emergency stay will also be requested preventing you from killing my dog, Stu pending a ruling by the above mentioned court. I urge you not to act in any way detrimental to Stu’s life prior to your receipt of the Notice of Appeal. Stu was a stray dog who adopted the lighting department on the Denzel Washington film Training Day in 2001. 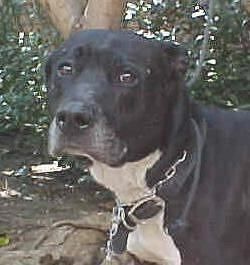 After 3 weeks of his company every night, all night, I could not leave him on the streets of the Crenshaw District. 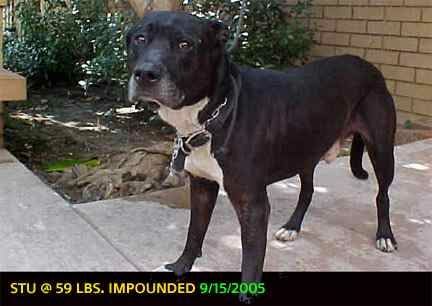 He was flea infested, tick-ridden and emaciated. We fell in love and I brought him home live with me and my other two dogs. The crew of Training Day was so taken with Stu that they donated over $400 for his care. Stu thrived in my care and is a smart and happy, well-trained dog. I took some effort to curtail his escape artist tendencies but I succeeded. For 5 years we lived happily together without a negative incident. In 2005 I was called away to the death bed of my mother and left Stu and the other dogs, Maeve and Annie, in the care of my assistant. For some unexplained reason, Stu and my other dog fought about something and Stu’s ear was badly injured. They do not have a history of fighting but were most likely disoriented by strange surroundings. Against my instructions, the assistant locked herself in a small room, cornered a dog in pain and attempted to slide a harness over his torn ear. Stu was scared and bit her. She has been treated for her injuries and will receive an equitable settlement from my insurance company. A Los Angeles Animals Services hearing was convened in which I was deprived of witnesses and evidence was destroyed by the department and in spite of this, the Hearing Examiner found Stu to be NOT DANGEROUS. However, the embattled then GM, Guerdon Stuckey reversed this decision and declared Stu DANGEROUS and sentenced him to die…. According to a WVEC.com report (citing ESPN Radio), nearly three dozen dog carcasses were found on the Virginia property formerly owned by Atlanta Falcons quarterback Michael Vick. The warrant to excavate and search the property was executed earlier today and based on the video, it was obvious that they began to discover the remains of dead dogs early in their search. The remaining portion of the day was spent digging up the rest of Vick’s former yard in order to find any and all remaining deceased K-9’s. I have stuck to my guns and stated time and time again that Vick is innocent until proven guilty, and while that remains a fact by law, you can not dispute this evidence. Both Boddie and Vick are in serious, serious trouble and a five-year prison sentence may be right around the corner. 1. Contact the Falcons. Now we REALLY need to step up the complaints about Michael Vick being allowed to continue as a player! Terms like boycott, canceling season tickets, etc… would help. 2. THANK the US Attorney’s Office for taking over this investigation! If not for him, the dead dogs would not have been found. Marine Connection has been alerted to the capture of 20 dolphins in the Solomon Islands. Following another illegal dolphin capture in 2003 where several of the animals were exported to a captive facility Mexico, a ban was put in place by the Solomon Islands Government; however it appears this ban covers only the export of dolphins from the islands and does not include captures destined for the local market. The charity needs only five minutes of your time to help release the recently captured dolphins. Please click on the below link and email the Prime Minister of the Solomon Islands expressing your concern that these captures have been allowed to proceed despite the ban, and urge the Solomon Islands government to demand the immediate release of the captured dolphins. ©iStockphoto. Fred looked like this feral pig, but he was trusting and friendly. He suffered a three-hour death at a canned hunt. Fred was longer than nine feet long and weighed half a ton. Since Lost Creek charges $1.25 a pound for what they call (inaccurately, in Fred’s case) “feral meat hogs,” operators figured to make more than a thousand dollars on Fred. They turned him loose in a 150-acre fenced enclosure, from which Fred had no chance of escape. On May 3, they sent paying customers Mike Stone and his 11-year-old son, Jamison, into the enclosure to hunt him down. A Slow Death – Fred had never been wild, and he had never been hunted. People had always been his friends. They had fed him, rubbed his snout, and brought him treats. When he saw Jamison approaching with a pistol, he may have been curious, but nothing more. Then Jamison shot him. People had always been his friends. They had fed him, rubbed his snout, and brought him treats. When he saw Jamison approaching with a pistol, he may have been curious, but nothing more. Then Jamison shot him. During the pursuit, Jamison shot Fred a total of eight times. Jamison’s father and two guides had high-powered rifles and could apparently have dispatched Fred a number of times during the chase. But they held their fire and let Fred suffer pain and fear for three long hours before Jamison finally succeeded in ending his misery. Legislation to ban canned shoots of exotic mammals regardless of the size of the shooting facility has made it out of committee and passed the New York Assembly, but its passage in the Senate is at risk. Even if you have taken action on this issue before, please take a moment now to call one more time and express your opposition to this unfair, inhumane practice. This is our last chance to protect helpless, unsuspecting animal victims of unsporting shooters and we need every New York animal advocate to take part in this priority campaign. Every phone call and email counts! CALL Senate Majority Leader Joseph Bruno right away at 518-455-3191 and ask him to pass S. 784 to ban canned shoots of exotic mammals in New York. In order to succeed, we must show that we have not forgotten, that we will not give up. I can assure you the cockers have kept up their pace. The anti-cockfighting bill seems to be in limbo. We need more public appeals to get things moving. The inhumane Ritchie bills seems to be dead, a huge step forward, however, the Ag committee may dissect the Lentini bill, adding Ritchie amendments, transforming it into a bill that is better off dead than passing–we’d be better off with nothing. One of the debating amendments is the phase out of cockfighting. Although, a phase out date of 12/31/07 is better than waiting another year to start the fight again, we all know what will occur if there is a phase out: Chickens will be fought relentlessly — the cockers will have nothing to lose. There will be a huge influx of cockers coming to Louisiana from throughout the U.S. during those phase out months, all wanting to “dissolve” their living stock and fighting equipment. Cockfighting will be legal in Louisiana for another 6 months — the cockers will make the “best” of it. 1. Contact legislators. Be sure to include your address. 2. Contact your own legislator personally [IF YOU’RE A LOUISIANA RESIDENT], with a phone call or a personally addressed email. 3. Email Representative Michael Jackson larep061 [at] legis.state.la.us — vice-president of the Louisiana Legislative Black Caucus. Ask him to support an immediate ban and to persuade members of the Black Caucus to do the same. 4. If you are from out-of-state, state your reasons of how this bill would affect you and your state, such as the bird flu, but also how allowing cockfighting in Louisiana isolates us from the rest of the country and could certainly affect future aid in times of disaster. 1. Support an immediate ban, NO PHASE OUT. 2. Support Lentini’s SB 39, without amendments. in order for the site to quickly gain ranking on the search engines. Please help me send whatever you can to this sanctuary below. Oasis has been taking on as many animals in dire straits as it can handle, and has just been hit with a financial shock that is setting them back and crippling their ability to take care of the animals they have. I sent as much as I could and am writing to you to ask you to find it in your heart to please send whatever you can to them. Eddie Rizzo’s untimely death in 2004 was a great loss to me, Oasis and to the animal community. Rizzo, as he was affectionately called, was more than the Co-founder, Director and my best friend for over 25 years, he was also a wildlife rehabilitator, a dog trainer and a strong positive presence in the Catskill community. He always went beyond the call of duty to help the “hopeless” both animal and human. I want to ensure the survival of Oasis Sanctuary so we can continue the important and difficult task of helping animals in need…I am asking you, our friends in the animal community, to assist us in this task. Click “Adopt A Critter” http://oasissanctuary.org/oasis/oasis.html to see our adoptable animal residents. Click “Donations” http://oasissanctuary.org/oasis/oasis.html to visit our donation page. With your help we can overcome our current challenges and continue to be here to help the chained up dog, the abandoned cat or the farm animal whose next stop would be the abattoir. Many sickly, unwanted, troubled and fearful critters all found a home at Oasis. And while we have been a sanctuary for tough placements, we now find ourselves in a tough place. Please help us continue to help them. In November, we (The Donkey Sanctuary) were outraged to learn a donkey had been used in a Spanish bullfight in the town of Navaluenga to the west of Madrid. We also discovered a similar event had taken place in the nearby town of Burgohondo a few days later. Since then, we’ve been preparing a legal case to try to stop donkey use in the bullfights later this year. PS. Our charity provides refuge to donkeys in the UK, Ireland and other parts of Europe and we help working donkeys in Egypt, Ethiopia, India, Kenya and Mexico. 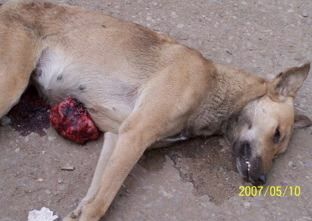 This female dog was shot in Egypt today at 1:15 in the afternoon. Her agony lasted for 15 minutes, because it is only one bullet for each dog (to save money). This dog was pregnant. Please note: I have been alerted to this matter because of my interest in advocating for justice and the humane treatment of animals. As a result, this may be one of many like letters you will receive. However, it expresses my own views on this issue and is signed by me as an individual. I hope you will consider it as such. I am disgusted and outraged by the death and devastation surrounding the nationwide slaughter of Egypt’s abandoned animals. I appeal to your collective sense of humanity and decency to terminate this disgraceful brutality carried out by municipal officials, police and even citizens of your nation. Egypt has turned a deaf ear to the cries of inhumanity for too long. Until Egypt brings visible evidence to the world community of a vigorous campaign to alleviate the suffering of all animals and seeks professional assistance to humanely remedy the gross overpopulation, neglect and brutal cruelty issues, you can be assured that my tourist money will be spent and appreciated in more animal friendly and civilized venues. I will publicize the dreadful photographic evidence extensively and vigorously discourage tourism to your country. Perhaps a fiscal decrease in Egypt’s bottom line” will awaken her instinctive sense of humanity. * Rowan County: Tell Judge To Help Us. Dogs Suffering. 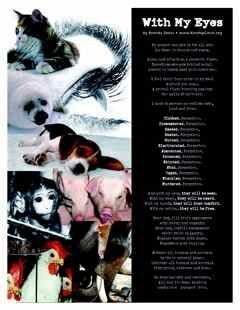 * Take the pledge to stop puppy mills! * Tell Bush/Cheney Administration: Stop Offshore Oil Drilling! * Mexico: STOP OFFICIAL CRUELTY AGAINST ANIMALS IN ANTI-RABIES CENTERS! Can you help Kinship Circle recover… by DONATING to the printing of our educational materials? We don’t have the funding, but we do have the facts and creativity to produce uncommonly effective literature. Your support is deeply appreciated. * Kindly do NOT use your junk mail filter. * Select a Kinship Circle ALERT received in your mailbox. * Enter kinshipcircle [at] brick.net and send. [Type UNSUBSCRIBE in your subject line]. *Kinship Circle cannot guarantee the validity of email addresses. During a campaign, recipients may change or disable their email addresses. This entry was posted on Wednesday, June 20th, 2007 at 9:00 pm. You can follow any responses to this entry through the RSS 2.0 feed. You can leave a response, or trackback from your own site. that dog that was shot in Egypt was really sad i love animals all animals are my favorite i am a even a vegetation that’s how much i love animals when i was looking animal abuse photos i stared crying i love animals my name is kaylea and i’m 11 years old.